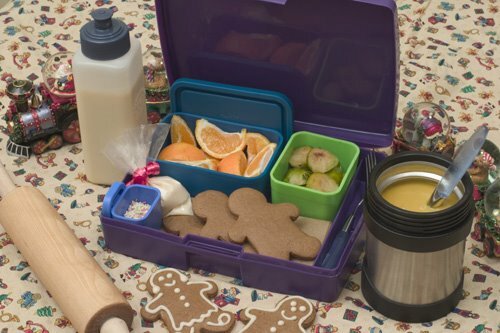 Here's my Christmas present to all of you: a complete Christmas Lunch Box Menu with all the recipes: Golden Chestnut Soup, Best Brussels Sprouts, a clementine mandarin, and some Gingerbread Vegans with a tiny piping bag of icing and some sprinkles. Beverage: Silk Nog, of course! Verdict: I think Little shmoo sucked every last smidgen of icing out of that plastic bag. He ate all the Brussels sprouts, but only half of the soup. My husband really went all-out on this great photograph -- our dining room looks like a photo studio! 5 Ho Ho Hos! P.S. The kids are on vacation until next year, so see you in January! 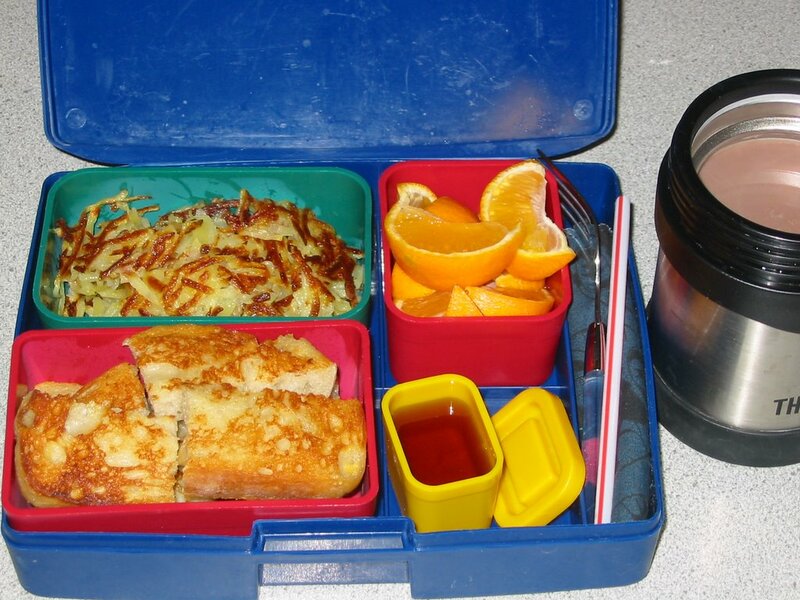 Last week while helping out at school I overheard this conversation between two middle school boys in the hallway: "Dude, you won't believe what I have in my lunch today -- french toast!" "Aw, man!" French toast, huh? I can do that! I used the fronch toast recipe from my new favorite cookbook, Vegan With A Vengeance, and packed it with a tiny container of maple syrup, some hash browns, a clementine mandarin, and a thermos of hot soy cocoa. Verdict: What's not to love? Every bit got eaten up, even the crusts! 5 stars. Little shmoo has been begging me for three months for a can of Tuno from the health food store. I asked my friend Mike at the store, "Have you tried this?" With that glowing recommendation in mind, I put off buying it for as long as I could, but the shmoo finally wore me down and I bought a can. The instructions said to use Tuno as you would tuna, so I mixed it with vegenaise and capers and put it on white bread. I packed it with tater tots & ketchup, green beans, and grapefruit segments. After I took some pictures I still felt extremely doubtful, so I said, "I think you better take a bite of this now in case you don't like it." Shmoo took a bite and made a big nasty face. I took a bite and made an even bigger nasty face. The Tuno went in the trash and I slapped together a pb&j. I thought about taking a new picture and forgetting this whole sorry incident, but instead decided to let it stand so I could ask all you Tuno lovers out there...where did I go wrong? Verdict: 0 stars for Tuno, with a tip o' the hat to peanut butter for always being there for me. 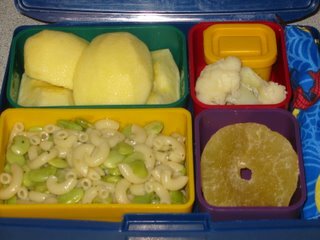 This is one of Little shmoo's favorites: pasta with lima beans and rosemary- infused olive oil. I packed it with an organic apple, some cauliflower with a small container of Original Yumm! Sauce (this stuff is pure heaven -- a gift from my mom's recent trip to Oregon), and a piece of dried pineapple. Verdict: He said the Yumm! Sauce was "too sour" (I notice that whenever I make uncheeses I have to use half the lemon juice called for or I get the "too sour" verdict...they seem just fine to me, so I guess it's a sign of his young, sensitive palate). Anyway, he ate some of the cauliflower plain and ate every last bit of the pasta and lima beans and fruit. "Those are some tasty limas!" he reports. 4 stars. 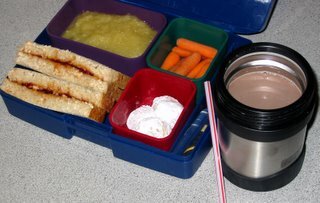 I made some soymilk cocoa this morning and packed it in his thermos (I had to trim the straw to fit in the lunch box). Little shmoo drank the cocoa and nibbled on three little powdered sugar- covered cookies made with strawberry jam. The rest is rather ordinary (with cocoa and cookies as the treat, who needs a fancy lunch? ): organic applesauce, baby carrots, and a peanut butter and strawberry jam sandwich on oat bread. Verdict: Just crusts and two carrots left. 4 stars. little flautas. Brussels sprouts are on the side with a tropical fruit cup and an organic strawberry fruit leather. Verdict: "These are tasty!" I was volunteering in the classroom today so he shared one with me, then regretted not saving it for himself. Just one sprout was left over. 5 stars. Our little thermos is getting quite a workout in this cold weather. 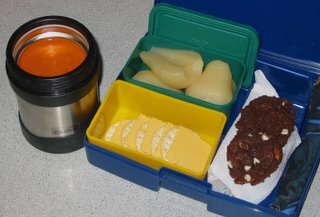 Homemade tomato-basil soup, with crackers and vegan cheese, canned pears, and two fresh-baked chocolate cookies with oh-my-god vegan white chocolate chips (part of my recent shipment from Vegan Essentials...why yes, I do think white chocolate chips are essential, don't you?). 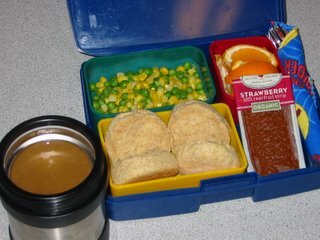 Verdict: About the cleanest-looking lunch box I've seen in a while. He didn't even leave any crackers behind. 5 stars. P.S. 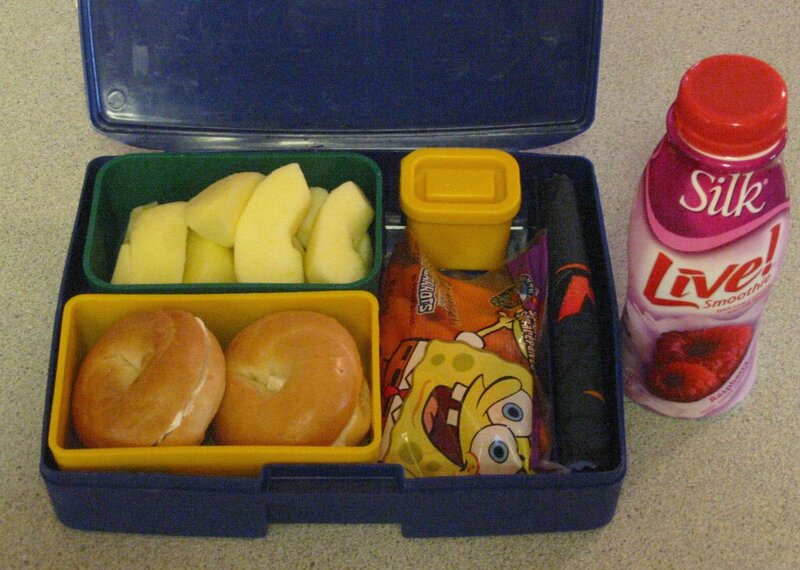 Tomorrow is another noon release day -- no lunch box! 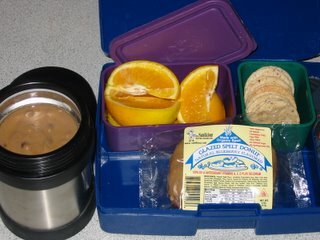 I baked some spelt biscuits this morning and packed them with a thermos of hot gravy filled with chunks of seitan. Pour the hot gravy over the biscuits for a warm, filling lunch. 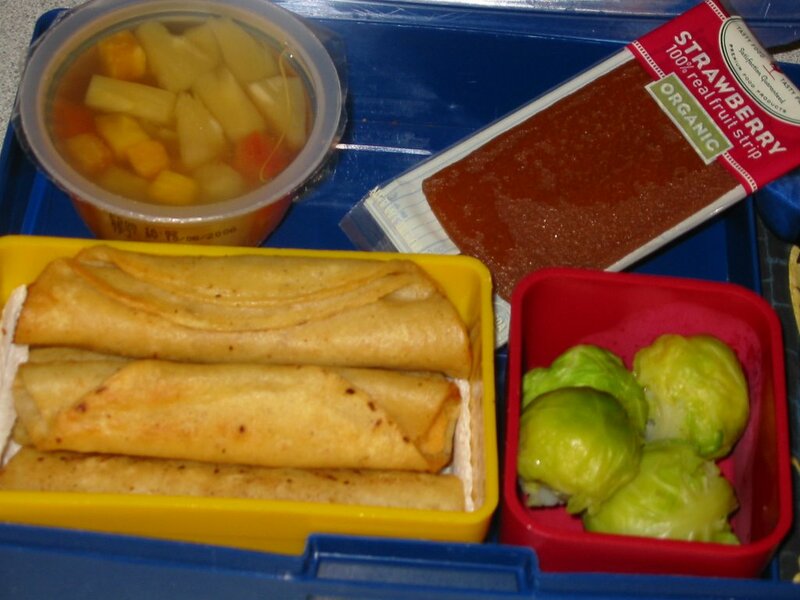 Some peas & corn on the side, with a little clementine mandarin and an organic strawberry fruit leather for dessert. Verdict: Messy, but tasty on a cold December day. 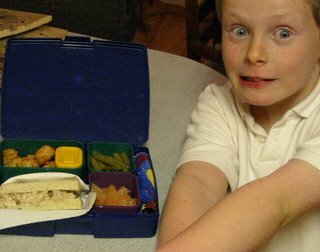 He ate everything but the clementine, which he saved for after school. I found these organic fruit leather at Target, of all places. 4 stars. 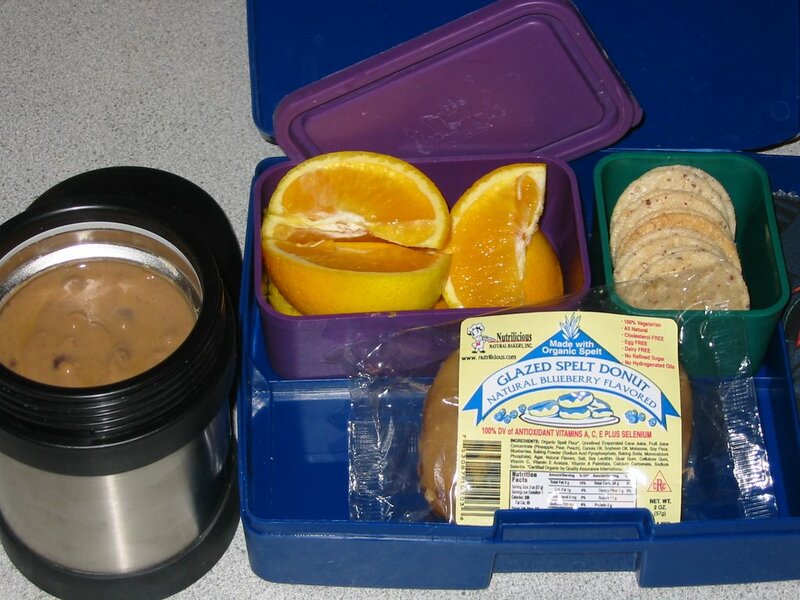 Little shmoo's favorite black bean soup today, with some smokehouse almond rice crackers and an organic orange. For dessert, a shipment of goodies from Vegan Essentials arrived just in time to send shmoo with a vegan blueberry donut! Verdict: This worked out even better than I had planned. It turns out that a group at school was selling donuts today as a fundraiser, and there I was with a vegan donut to put in his lunch box! 5 lucky stars. 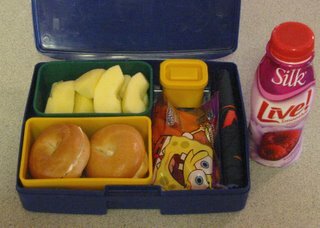 Two mini-bagels with vegan cream cheese, an organic apple, and a Spongebobish bag of baby carrots with some mashed pinto beans mixed with Bragg's for dipping. Beverage: a raspberry Silk Alive! soy yogurt drink. Verdict: I knew he would only finish half the bag of carrots, but I had to leave the carrots in the bag because hey, it's a cartoon character promoting a fresh vegetable! Hooray! I mean, I don't know if Little shmoo has ever actually seen "Spongebob Squarepants" (we don't have TV), but I'm supporting this 100%. Next I'd like to see Batman promoting kale...then maybe shmoo would eat it! 4 stars.